1747 - Manor of Leeds - By John Warner 4th edition. 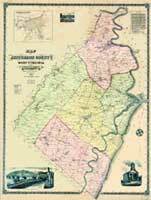 - as written: A Survey of the Northern Neck of VIRGINIA, being the lands belonging to the Rt. 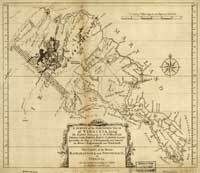 Honourable Thomas Lord Fairfax Baron Cameron, bounded by & within the Bay of Chefapoyocke and between the rivers Rappahannock and Potowmack: with the Courfes of the rivers Rappahannock and Potowmack, In Virginia, as surveyed according to order in the years 1736 & 1737. 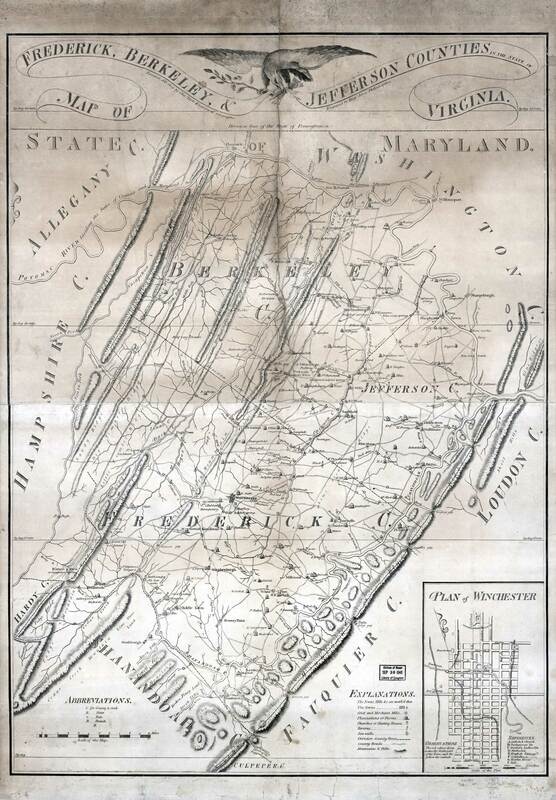 Repository: Library of Congress Geography and Map Division Washington, D.C.
1751 Fry Jefferson map - A map of the most inhabited part of Virginia containing the whole province of Maryland with part of Pensilvania, New Jersey and North Carolina. Drawn by Joshua Fry & Peter Jefferson in 1751. 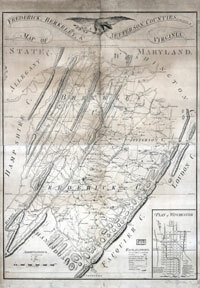 Repository: Library of Congress Geography and Map Division Washington, D.C.
1769 - Map of the county of Frederick, 1769. Drawn by J. Moffett. 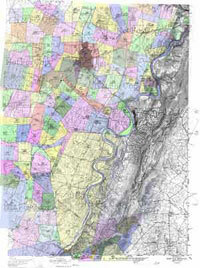 Repository: Library of Congress Geography and Map Division Washington, D.C.
Northern Neck Land Grants - Jefferson County, West Virginia. Plotted by Surveyor Gustav Gertsema from original land grant records and placed on USGS Topographic maps. Color enhanced for clarity by Jacqueline Milburn. 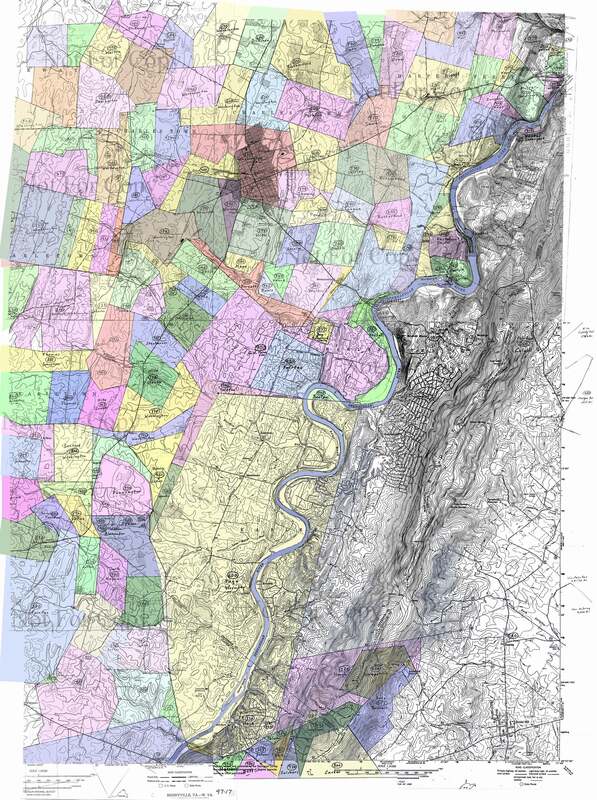 This map is provided to give an idea of original property lines. This map is for use on this site only and should not be copied or used in any way of used on any other site or published with out written permission. 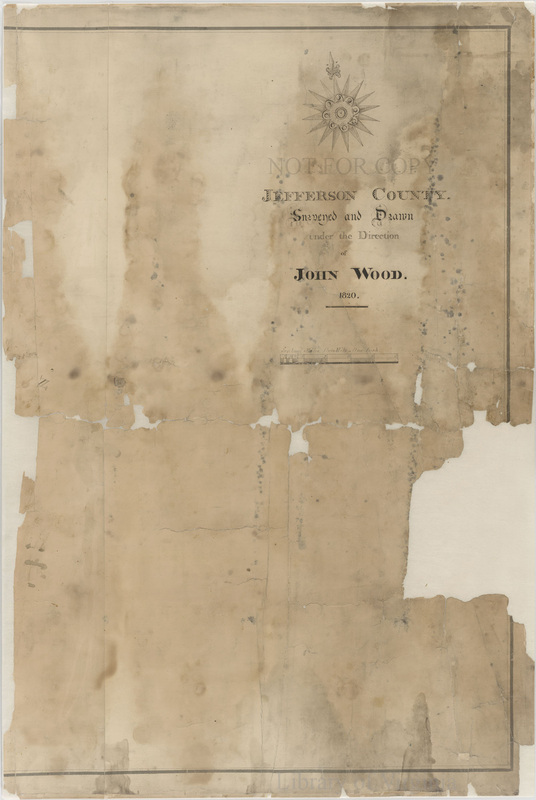 1820 John Wood map of Jefferson County - John Wood was contracted with by Governor Wilson C. Nicholas in 1816 to carry out surveys of Virginia's counties and to prepare from these surveys a map of the state. 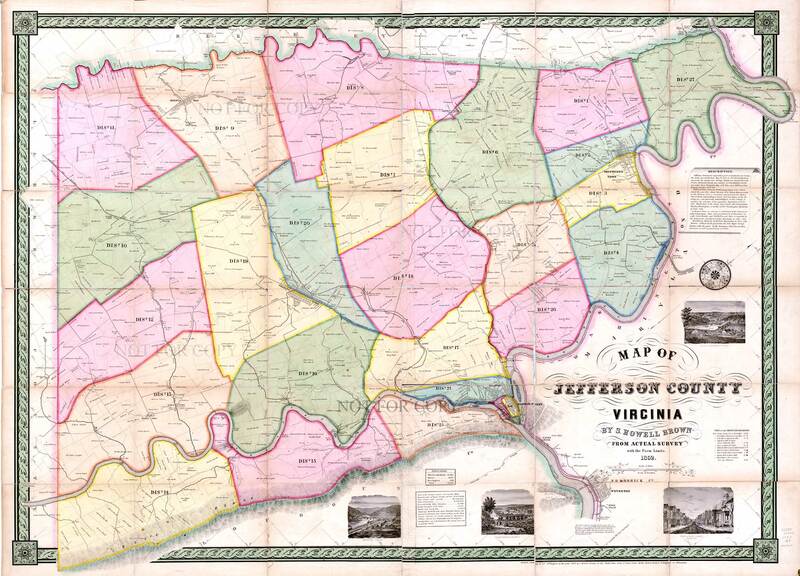 At this time, Jefferson County was in Virginia. 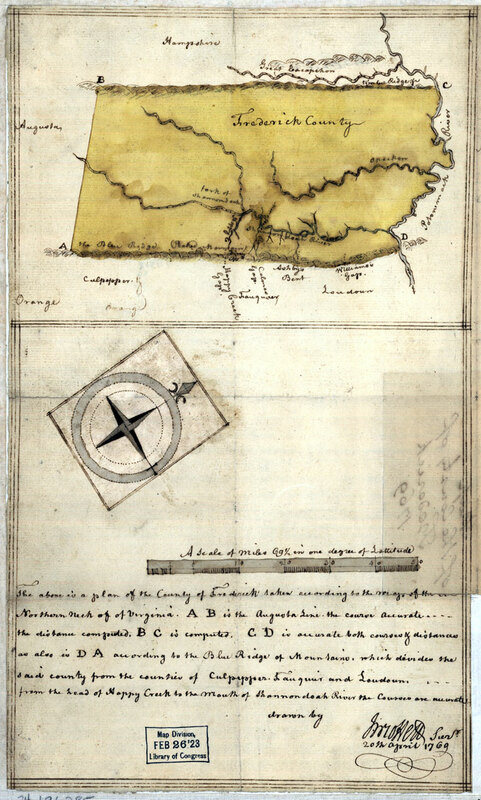 The maps, "designed for the use of the Executive," were directed to be deposited in the office of the secretary of the board of public works, to "be at all times open to the access of the Executive, or of any member of the General Assembly." (29 Va. Acts 1816-1817) When Wood died in 1822, Herman BÃye completed the project, which resulted in the state map published in 1827. It was corrected by Lewis von Buchholtz in the edition of 1859. 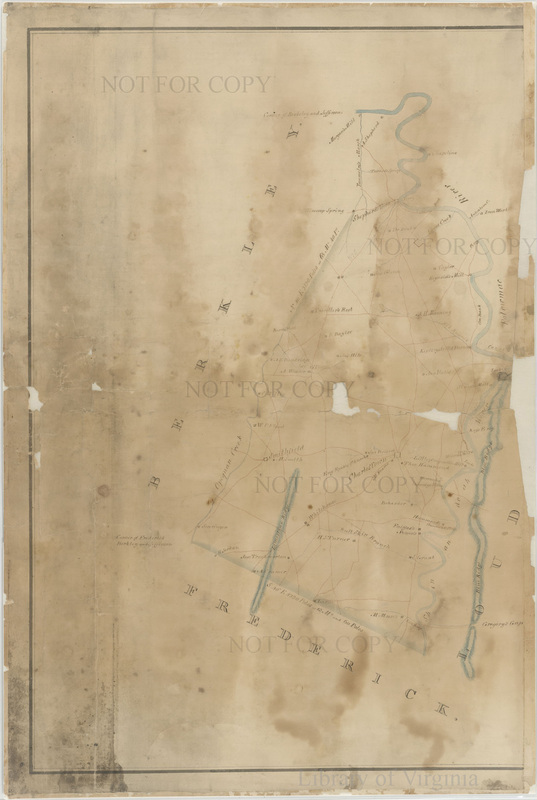 One in the series of county maps preliminary to BÃye's nine-sheet map of Virginia, published in 1827 (see map below). Relief shown pictorially. Pen and ink, watercolor. Shows water systems, mountains, geological features, ferries, canals, mills, ironworks, furnace, towns, churches, and some houses and owners. References Swem 422 BPW 711 (13). permission to use images was granted by Library of Virginia, 800 Broadstreet, Richmond, Va on April 4, 2012 - Do not copy or reproduce these images in anyway with out permission from said Library. 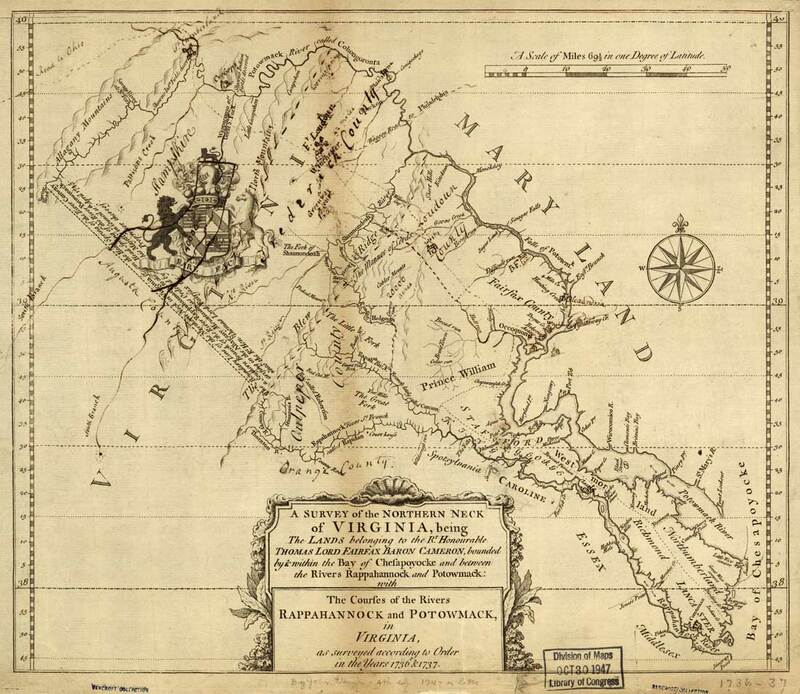 1828 Map of Virginia by Hermen Boye - A map of the state of Virginia : reduced from the nine sheet map of the state in conformity to law / by Herman Böÿe, 1828. Corrected by order of the executive (Governor), 1859 / by Lewis von Buchholtz. 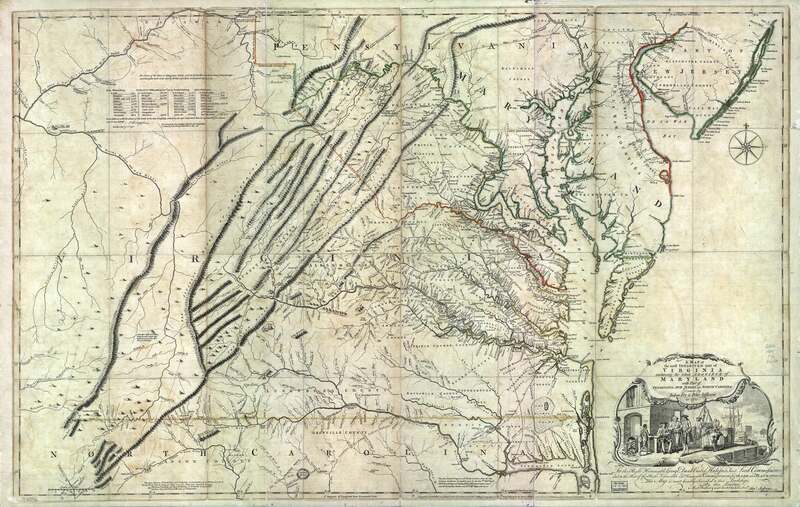 Repository: Library of Congress Geography and Map Division Washington, D.C.
On the right is a cut out of the Jefferson County area click to enlarge. 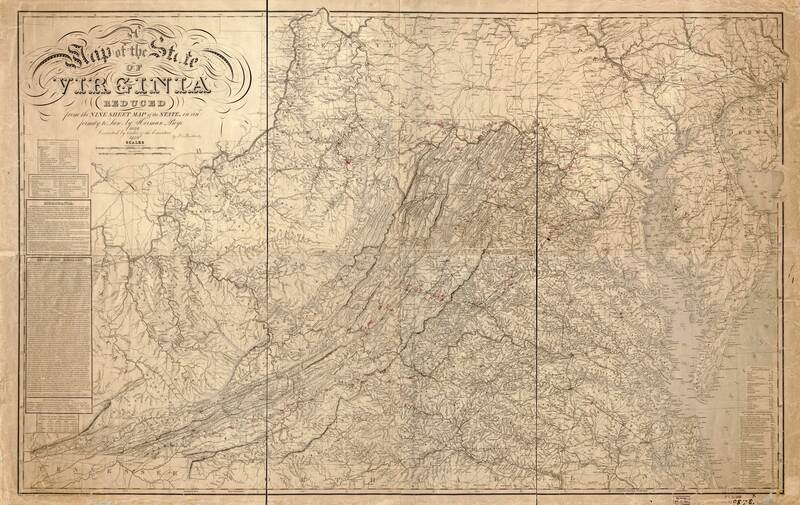 1852 Jefferson County map - Map of Jefferson County, Virginia / by S. Howell Brown from actual survey with the farm limits. 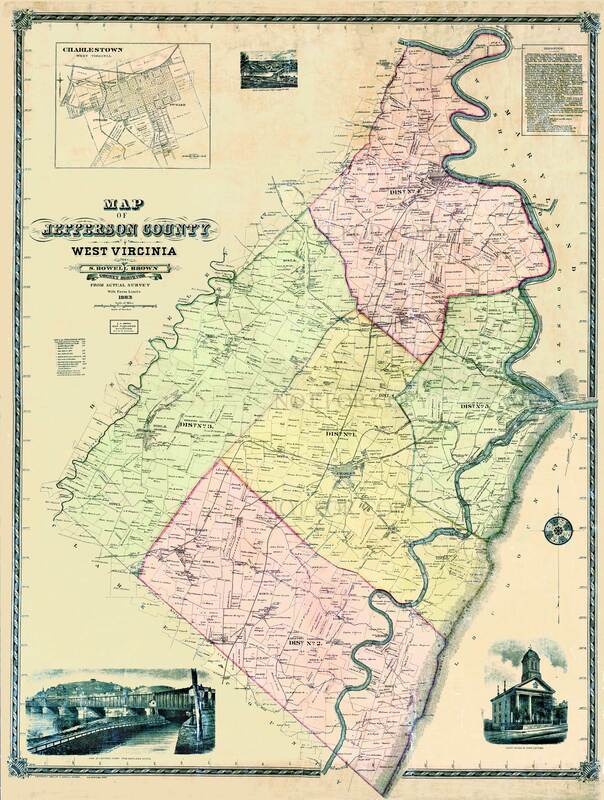 Shows Jefferson County before the formation of West Virginia in 1863. Relief shown with hachures. Oriented with north at upper right. 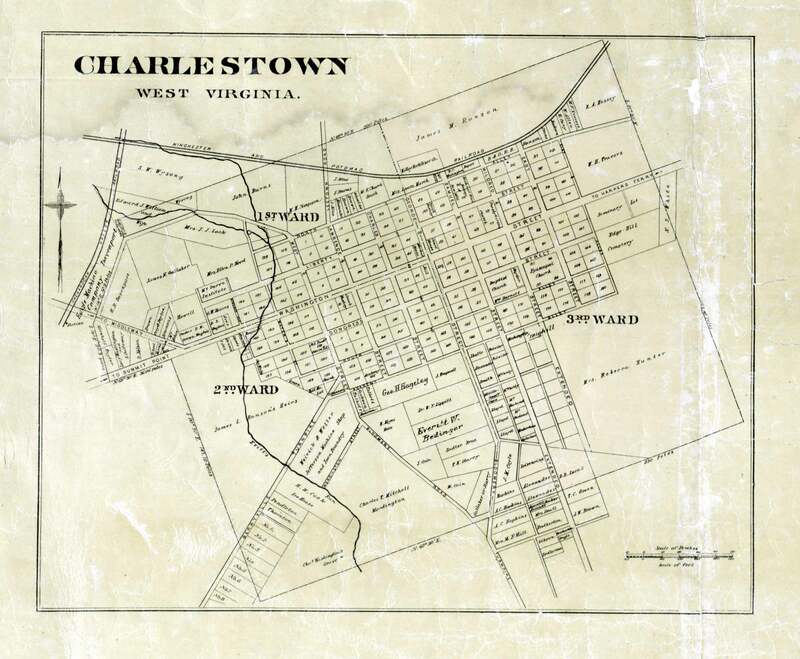 "Entered according to act of Congress in 1852 by Samuel Howell Brown in Western District of Virginia at Staunton." Repository Library of Congress Geography and Map Division Washington, D.C. Clear black and white copies can be obtained at the Jefferson County Museum in Charles Town, West Virginia. 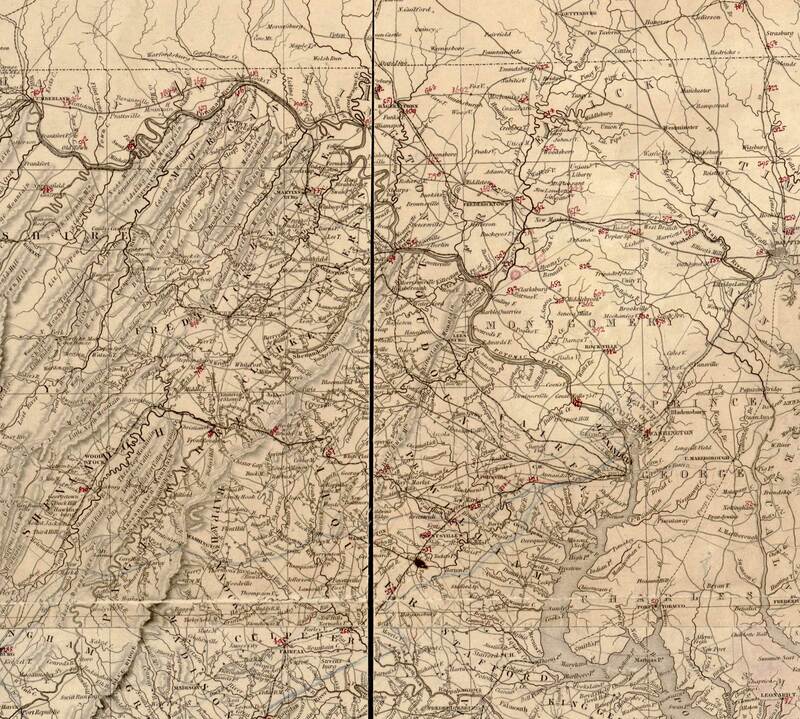 1883 Jefferson County map - Map of Jefferson County, West Virginia / by S. Howell Brown, county survey, from actual survey with the farm limits. Philadelphia : J.L. Smith, 1883. Shows district boundaries and land ownership. Relief shown with hachures. "Copyright 1883 by S. Howell Brown." 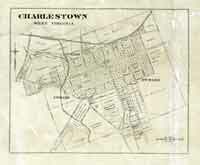 Includes inset of Charlestown, text and 3 illistrations. Repository Library of Congress Geography and Map Division Washington, D.C. Clear black and white copies can be obtained at the Jefferson County Museum in Charles Town, West Virginia.